A Wisconsin-based contractor will pay $3 million to resolve its liability arising from improper use of foreign materials on federally funded construction projects. Glass enclosure specialist Novum Structures violated contractual provisions that apply domestic preference statutes, recognized as “Buy American” requirements, according to the Department of Justice (DOJ). 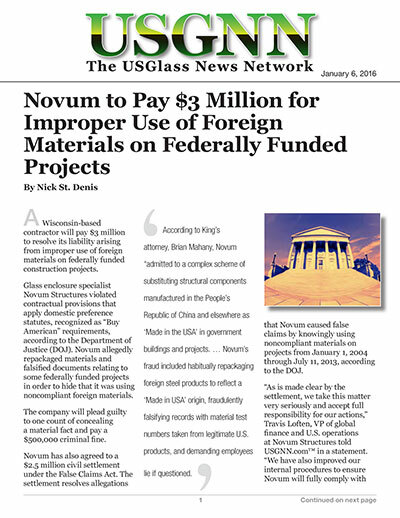 Novum allegedly repackaged materials and falsified documents relating to some federally funded projects in order to hide that it was using noncompliant foreign materials. Novum has also agreed to a $2.5 million civil settlement under the False Claims Act. The settlement resolves allegations that Novum caused false claims by knowingly using noncompliant materials on projects from January 1, 2004 through July 11, 2013, according to the DOJ. The allegations were originally brought by ex-employee Brenda King under the whistleblower provisions of the False Claims Act. Construction projects funded by the U.S. government are normally subject to laws requiring the use of domestic materials, such as the Buy American Act; the Federal Transit Administration’s Buy America provision; and section 1605 of the American Recovery and Reinvestment Act. The contracts involved in this case covered government buildings and transit projects partially paid for with federal funds. “It is important to note that the noncompliance relates solely to the country of origin of the products. At no time was there an issue with the quality of materials used,” said Loften. “We have taken action to resolve the vast majority of the noncompliance issues, in many cases replacing non-compliant foreign-sourced products with Buy American-compliant counterparts. “It is also important to note that the Buy American requirements applied to a very small part of Novum’s business. Additionally, the noncompliant materials used represented a small fraction – less than 3 percent – of the value of the work on the few projects that were subject to Buy American requirements. The False Claims Act permits private parties to sue on behalf of the government those who falsely claim federal funds. The act also allows the whistleblower to receive a share of any funds recovered through the lawsuit. King will receive approximately $400,000 as her share of the civil settlement.